This page was last updated on February 17, 2019. Until June 1907, all of the ore came from Utah Copper's underground mine. The concentrates from Utah Copper's Copperton mill were shipped to the Bingham Consolidated smelter at Midvale, by way of the RGW. 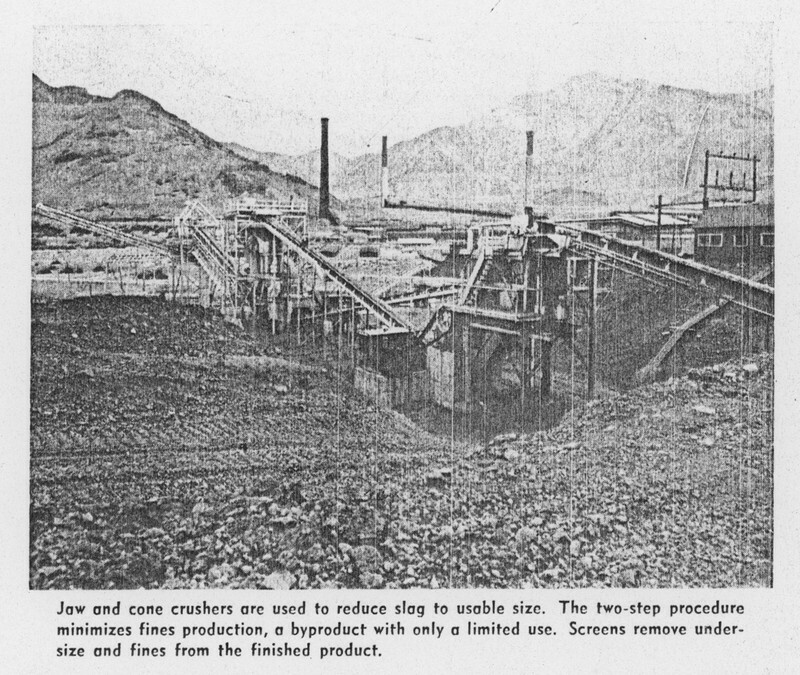 Asarco began recovering sulphuric acid from the smelter gases at the Garfield smelter. A modern slag crushing and screening unit has been installed at the edge of the slag dump at American Smelting & Refining Co.'s Garfield Smelter to facilitate treatment of slag, found extremely useful as ballast on western railroad grades. Slag has become popular as ballast because of its excellent drainage characteristics which lead to longer tie life. It also provides a more rigid roadbed than other materials. It has led to a brand new activity at Garfield. Some 30 million tons of slag are already in the dump, with monthly additions of 50,000 tons adding up to what appears to be an inexhaustible supply. The crushing and screening unit was installed by Utah Sand and Gravel Co., independent contractors. Asarco granted additional right-of-way for the slag treatment plant and necessary service spurs to the Western Pacific Railroad. Western Pacific is the present ultimate purchaser of the slag which is used for an extensive modernization program. The slag is employed for ballast on the main line. Dumping of the molten slag takes place around a major part of the dump's roughly circular periphery. The treatment plant had to be located where future dumping would not take place. A means for removing the solid slag from the interior of the dump had to be provided without interfering with present haulage or undermining existing trackage and other facilities. Slag is partially broken up with a modern scarifier and bulldozed to a loading point where a shuttle feeder places it on a conveyor belt. The conveyor transports it under the slag haulage track to the crushing and screening plant. A jaw crusher and a cone crusher give the desired size reduction. The two-step process for size reduction minimizes the production of fines, a limited-use byproduct. Slag is water-treated before crushing to eliminate dusting during preparation and loading. Vibrating screens remove undersize from the crusher feeds as well as fines from the finished product. The prepared ballast is -1-1/2 +3/8 in. in size. The -3/8 size is being stockpiled at present, but there is hope that someday it may be used for road surfacing and concrete aggregate. The finished product is lowered to the loading level by means of a rock ladder. The rock ladder is an enclosed tower with projecting shelves alternating on opposite sides, preventing material falling far enough to create further reduction. Present capacity of the plant is 240 tons of prepared slag per hour. The plant is operated five days per week. 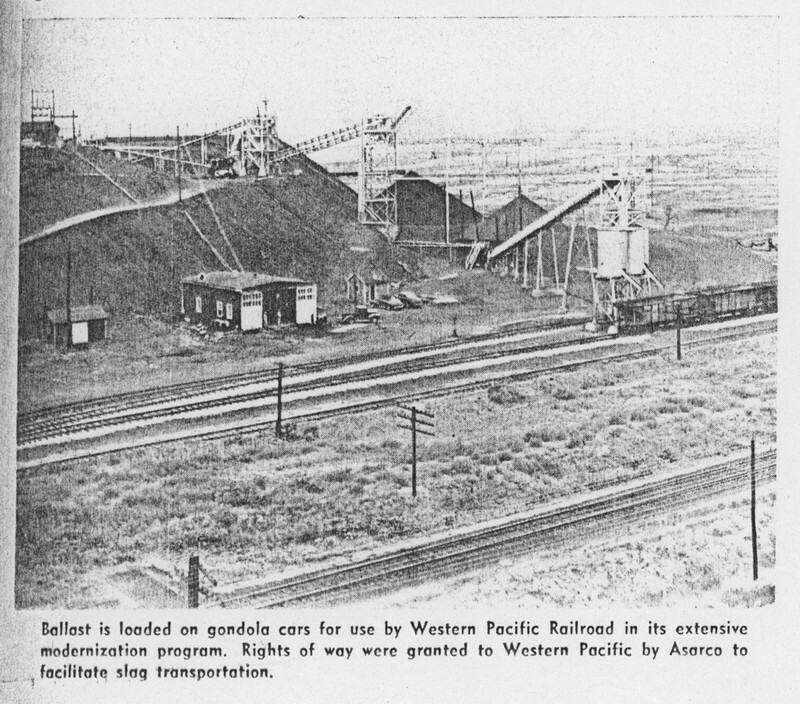 Slag is eventually loaded into Western Pacific Railroad hopper cars for transportation to points of use. Western Pacific and Asarco have both benefited from development of this new byproduct. The new Kennecott Utah Copper smelter, started in 1995, was designed to be the cleanest smelter environmentally in the world. The plant is operating at production rates above the original design capacity. Copper concentrate is smelted in an Outokumpu flash smelting furnace. Matte is granulated and processed using Kennecott-Outokumpu flash converting. Copper anodes are processed in a modernized copper refinery using the Kidd Process. Kennecott Utah Copper Corporation (KUCC) expanded its mine and mill facilities in 1988 increasing the production rate to 773,000 tonnes per year of copper concentrate. A further expansion of the mill in 1992 raised the concentrate production to 1.0 million tonnes per year. The smelter facilities could only process about half this tonnage primarily because of insufficient acid plant capacity to meet increasingly restrictive air emission regulations. The remaining concentrate production was sold.